A Fantastic Merger of Molasses and Sugar Cane Juice. Located in Veracruz, this family-owned distillery dating back 55 years and spanning three generations creates small batch Rum using natural yeast to ferment molasses and sugar cane juice in continuous column and pot stills. The 15 Year Old is a blend of 30% column-distilled Rum from molasses and 70% pot-distilled Rum from sugar cane juice (Rhum Agricole). Two different styles of Rums, merged together, and balanced to make a heck of a good sipping pleasure. - The Rum is named after the heroes of the Mexican revolution. Los Valientes means the valiant or the brave. 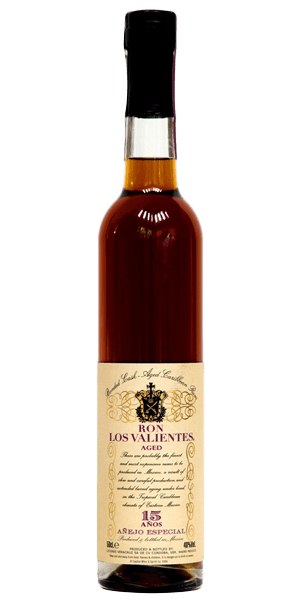 What does Los Valientes 15 YO taste like? The Flavor Spiral™ shows the most common flavors that you'll taste in Los Valientes 15 YO and gives you a chance to have a taste of it before actually tasting it. Burnt sugar, thick molasses, toasty oak, lush toffee, raisins and leather. Caramel, dark chocolate, ginger, exotic dark spices and some rancio.